Christmas music playing in stores. Christmas shows on TV. Christmas decoration everywhere. And bloodshed in Connecticut. Such a sad, sad day for everyone. At a time of the year when we should be rejoicing, someone with some sort of vendetta walks into an elementary school and opens fire on whoever gets in his way, 18 of them small children. What on earth would make someone shoot little kids!? I am absolutely appalled and heartbroken for the families of the kids and other people involved! I just can't fathom this. I think of my family - grown kids and step-kids, grandkids, neices, nephews, siblings, mom - and can't imagine something like this happening to any of them. My heart goes out to the families of the victims. The gutless murderer who did this deserves to spend the rest of eternity in pergatory. So, so, so terribly sad. A few weeks ago, a very talented and creative lady by the name of Madeline Marcelo posted on Facebook a picture of a luminary she had made. It was gorgeous and inspired me to make one as well. Well, one turned into a whole bunch of them since my papercrafting ladies will be making them when we get together on Thursday at noon. Once a month I look for something to do in our lunchtime class at work and decided this would be perfect for December! I found the flameless candles at the dollar store (2 battery operated tealights for $1.50) as well as the ribbon I decided to use for the windows instead of vellum (couldn't find vellum anyway). These are so incredibly easy to make! I found the most time was spent in deciding how to decorate it! I posted a picture of mine on Facebook today and had several requests for the instructions, so here you go. Not many pictures though, but I figure you can decorate yours any way you want! First, I set up the cuts for the windows on my Gypsy. The snowflakes are Shift - Accent 1 - Noel key. I made them 2" in height and positioned then so they were halfway between 3" and 6" and halfway between 6" and 9", and 1/2" below the top and center of the page. Once the snowflakes are cut, cut the paper at 6" so there are two snowflakes close together. (Sorry. I couldn't get one cut as we had company drop by so it all had to be put away.) 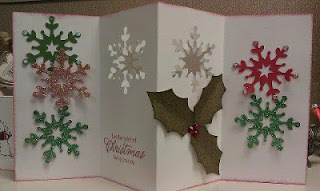 I also cut the same pattern in Ruby and Topiary cardstock (that's where my red and green snowflakes came from!) for my crafty ladies at work! Once it is all cut out, score each piece at 3", 6" and 9" and fold accordian style. Cut a piece of vellum or, as I did, use a wide shimmery ribbon or fabric to cover the windows. Use a good adhesive for this and make sure there are no wrinkles in the paper or fabric. At this point, you can either decorate the front (and back if you wish) before you stick the two pieces together or stick them together first and then decorate. I decorated mine first. ﻿To stick the front and back together, apply adhesive to the outer flaps of the front piece and line them up with the outer flaps on the back piece. This makes each end (where my red and green snowflakes are) solid and allows the center to make a square for your candle. Some of the embellishments I cut out for my ladies include Noel (same key as the snowflakes and cut at 1 1/2"), Ho ho ho (cut at 3" but I made it skinnier by unlinking the height and width and adjusting) from the Artiste (it is downstairs so I am not sure which key this is), and the holly leaves (2") and Christmas tree (the fancy one with the squiggles cut at 4") from the Art Philosophy cartridge. PLEASE do not use a real candle! Battery operated or flameless candles are available everywhere and are relatively inexpensive! I am so happy with how it turned out! I will post pics of my crafty ladies creations on Friday or this weekend!